Although Abigail J. was shocked when she won a $189,897 progressive jackpot at Slotland.com, staff had seen it coming. When their progressive jackpot was nearing a record level at the end of August, it was inevitable that it would be won soon.The lucky jackpot winner was playing one of the popular slots and video poker site’s newest and most elaborate no download slots, Pearls of Atlantis, when she hit the jackpot. Pearls of Atlantis is a 5 reel, 9 payline slot with a ‘Wheel of Fortune’ bonus game. Like most games, a max bet must be placed to qualify for the progressive jackpot. Although Abigail doesn’t always bet max she’s certainly glad she did this time. Unlike other casinos’ jackpots that never seem to be won, Slotland’s jackpot doesn’t usually accumulate for more than eight weeks or so. Over the years, the average win has been about $150,000. Last November, Henry W. won $207,241 -- Slotland’s biggest jackpot ever -- playing Treasure Box, one of the popular casino’s very first real money slot games. Slotland’s jackpot increases quite quickly again after it’s reset to $50,000 following a win since most of the casino’s slot games are tied to the one jackpot. 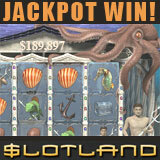 Slotland offers twenty-six one-of-a-kind online slots and video poker games. Several are also available as mobile slots. A new auto-racing themed game will launch later this month.